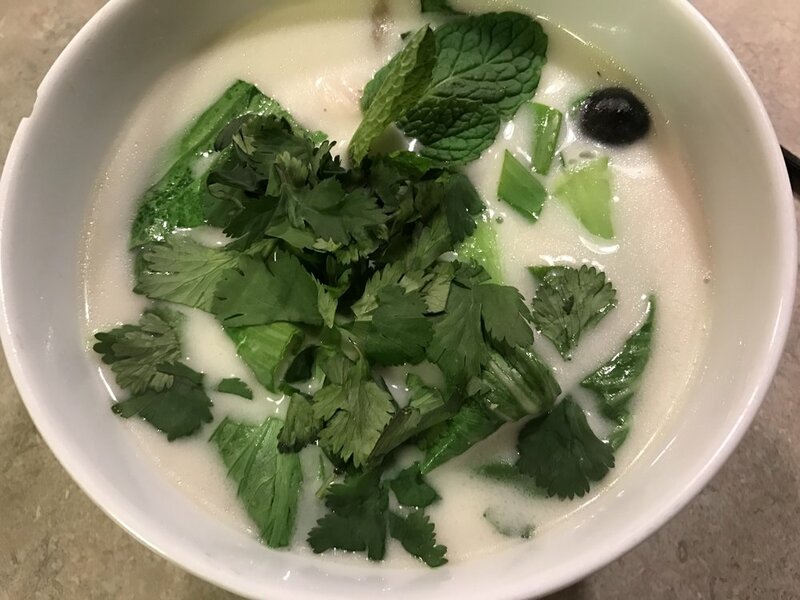 Probably one of my favorite chicken soups is Tom Kha Gai. There is nothing that I love more than the flavors of chicken, coconut, lime and cilantro. This is a little different version than I normally make but just as good. I love ladling this over some rice. Probably one of my most favorite of the Northern Thai and Hmong curry dishes is squash curry. In Madison, this dish reigns supreme at many of our local Thai, Lao or Hmong restaurants. Each place makes it a little different. My favorite place in Madison is Vientiane Palace because they roast their squash first. The roasting just takes the flavor to another place for me. But because it's fall and I often get lots of squash at the farmer's market and from my CSA (Keewaydin Farms), I had to make my favorite dish. This is a lightly adapted version from one I saw on Chowhound. As long as you always keep coconut milk and red curry in your pantry you can always make a good curry out of any veggie or meat you have. This version is without meat or tofu at all but when I get it at Vientiane Palace, I always get the tofu as it's the best one. I made this version using butternut squash but I prefer Kabocha squash as it's less sweet for me and the squash doesn't break down as fast as butternut does after cooking for a while, retaining some of the texture. You can really add any veggies to this with the squash. I had some zucchini but you can add green peppers, tomatoes, green eggplant, etc. They all taste really good together with the squash. Enjoy! Heat the oil in a large cast iron bot over medium heat until shimmering. Add the onion and 1 teaspoon of the salt and cook, stirring occasionally, until the onion has softened, about 6 minutes. Add the garlic and ginger, stir to combine, and cook until fragrant, about 1 minute. Add the curry paste, stir to coat the onion-pepper mixture, and cook until fragrant, about 1 minute. Add the coconut milk, coconut cream, water, soy sauce, fish sauce and remaining 1/2 teaspoon of salt, stir to combine, and bring to a simmer. Stir in the squash and other vegetables (zucchini or eggplant or tomatoes, etc) return to a simmer, reduce the heat to medium low, and continue to simmer, stirring occasionally, until the squash is fork-tender but still firm, about 20 to 25 minutes. *NOTE: you might have to wait to throw in zucchini for example as it will cook much quicker than your squash. So if you use zucchini, wait until 10 min after you added your squash to add. Add palm sugar to taste. I like to use it here depending on the acidity of the veggies you use. It will make the dish more complex and flavorful if you do. Remove the pan from the heat and stir in the lime juice. Taste and season with salt and/or fish sauce as needed. Sprinkle with the cilantro and serve immediately over steamed rice. I decided to surprise my husband and make him a big roasted piece of meat for dinner this sunday. He's a meat and potatoes kind of guy like my father was. And the way to man's heart is often through large hunks of roasted or grilled meat. I chose this recipe after reading Food52 as the choice of a coffee rub was unusual to me. I absolutely love Kona Mountain Coffee and had a few beans lying around so it worked out perfectly. I can't say the coffee rub added much flavor but possibly rubbing the night before might work better for this recipe next time. The coffee rub idea might be a good gimmick that a restaurant would do to get people to order this. I'm certain it would work. The parmesan mashed potatoes were awesome however! I loved how the ratio of cheese to sour cream balanced out very well. That recipe is a keeper. Enjoy! Take the roast out of the refrigerator and leave it at room temperature for 1 to 2 hours before handling. This is important so that the meat stays tender once cooked. *Note I would probably put the rub on at this point if not the night before next time. Preheat oven to 325° F (160° C) and place a rack in the middle of the oven. Grind the coffee beans and peppercorns and mix this with the salt and dried garlic. Rub the seasoning all over the roast with your hands. Heat a skillet over medium heat for several minutes until very hot. Add the butter and let it melt, coating the whole bottom of the skillet. Carefully add the roast and brown for 1 1/2 minutes on each side, using a pair of tongs to turn it. Do not move it other than to turn it. If using an oven-proof skillet, transfer the skillet directly to the oven. Otherwise, transfer the roast to a shallow pan (no deeper than 2 inches, so the heat circulates optimally) previously heated in the oven. Roast the ribeye for 25 minutes per pound. For a 5-pound roast, you’ll want to roast it for about 2 hours and 5 minutes. Roast to medium-rare which is 145F. Once done, remove roast from the oven and cover loosely with a sheet of aluminium foil. Let it rest for at least 20 minutes before slicing so as to allow for the juices to settle and redistribute. Fill a large pot with water, add potatoes and boil until fork tender. Drain the potatoes and return them to the cooking pot. Add in the butter and mash. Then add in the sour cream and parmesan cheese and stir well to combine.